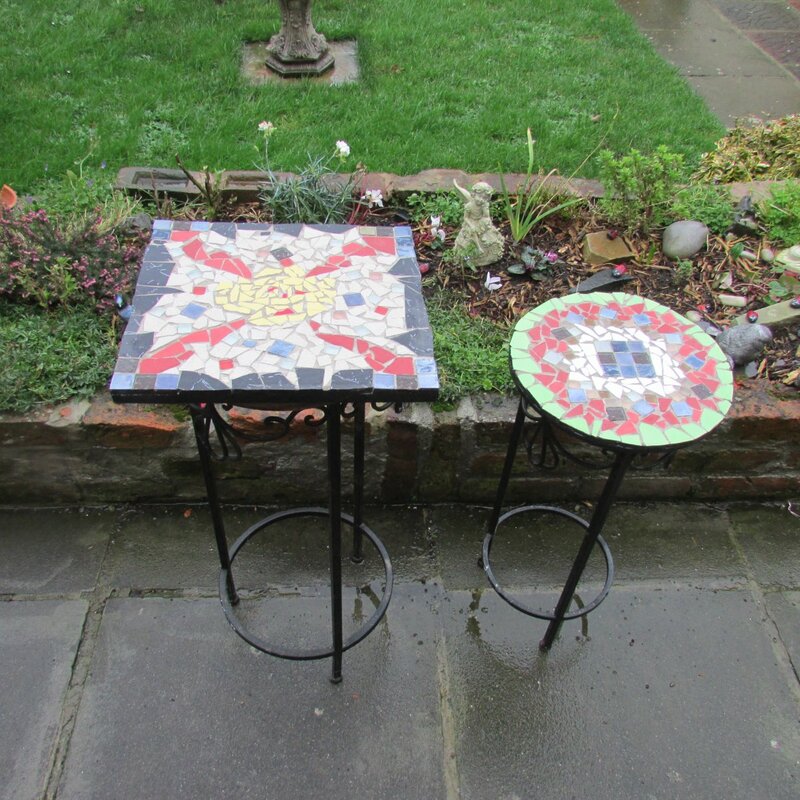 What do you think about upcycling or repurposing? With prices going through the roof, and a deeper understanding of what trash is doing to our planet, it only makes sense that everyone seems to be upcycling and repurposing these days. Now, whenever I get ready to throw something out, I find myself giving it a second glance and thinking about what I can make with it. 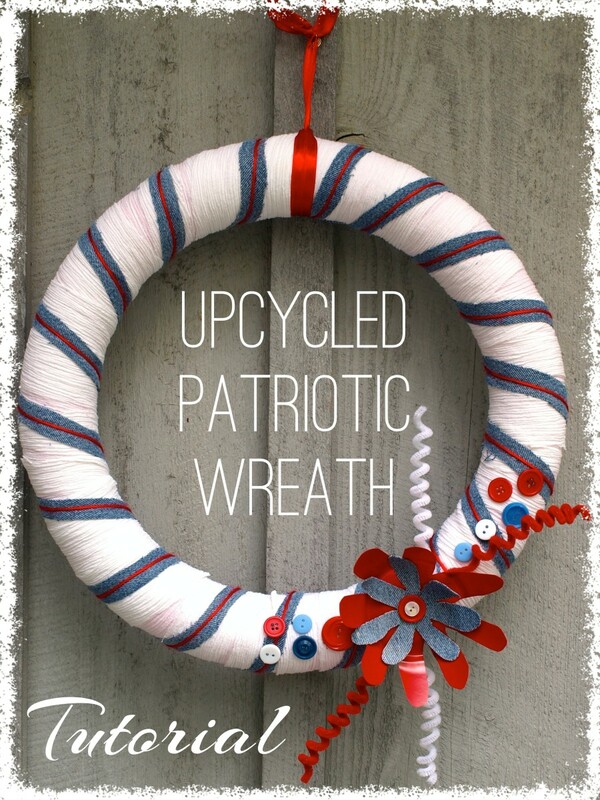 My latest creation with repurposed items is this patriotic wreath. Everything used to make it was found in my house, either in my craft supply stash, the kitchen, or in a pile of clothes that could no longer be worn. So, for exactly $0, and about 2 hours of my time, I now have a lovely wreath for the upcoming summer holidays. One of the things I really like about this project is that it can easily be transformed into a wreath for another holiday if you don't have the items that I used. Try greens, reds and whites for a Christmas project or shades of pink and red for Valentine's Day. See what you have on hand and give this festive wreath a try for your next upcycled craft project. This wreath is made in various stages, with time needed in between to allow glue to dry. Using an old pool noodle, join the two ends together and tape, using packing or duct tape. The noodle I used was about 50" long and 2" in diameter. I did not trim it to make it shorter, but if you don't want a large wreath, then you can trim it. If you are using a light colored blouse, use a pale pool noodle so the color does not show through the fabric. Choose a blouse or shirt for your wreath and begin to disassemble it. I chose this white crinkle gauze blouse that I could no longer wear because of the big mustard stain that wouldn't come out. 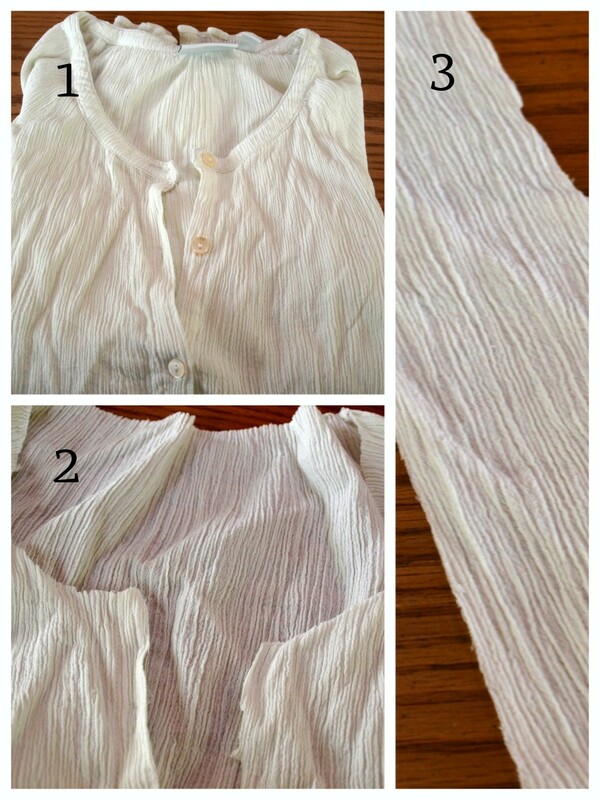 You'll need a lot of fabric strips so use an adult size blouse. Trim away all of the seams, hems, cuffs and buttons. Don't forget to save the buttons for another project! Cut fabric into long strips, each approximately 3" wide. Set aside. 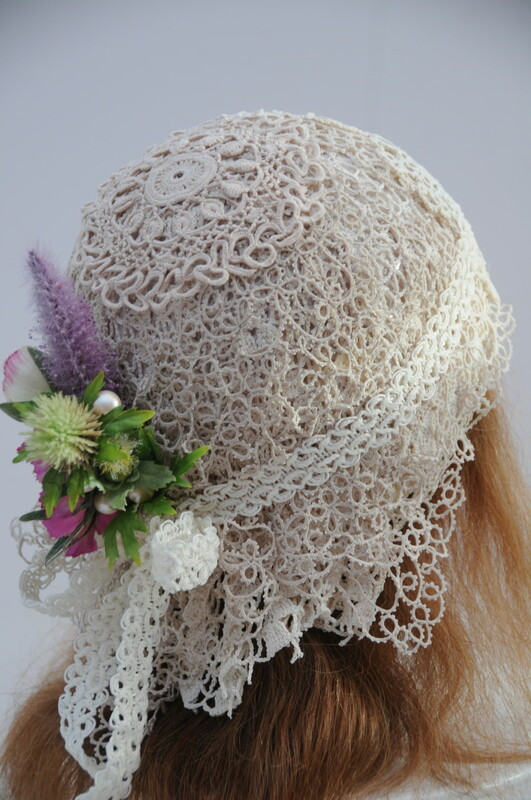 Determine what side you want to be the back of the wreath and start to wrap the fabric on that side. Use a hot glue gun to secure the fabric. Once the first strip is wrapped, glue the end down on the back side of the wreath. You may have to trim some excess fabric so the seam doesn't show on the front. Continue the wrapping process with the fabric strips. Completely cover the noodle with fabric. Depending on the color of the fabric, you may need to wrap a few sections again so the pool noodle color doesn't show through. Set aside so the glue can dry completely. Hot glue and foam pool noodles are not a great combination. You'll notice that the glue starts to dissolve the foam. Try not to use too much glue. Also, use care when wrapping. The glue is extremely hot and will burn your fingers! Using old, clean jeans, cut long thin strips, about 1/2" to 1" wide. I had jean scraps left from some other projects and used a pant leg to get nice long strips. Starting on the back side of the wreath, begin gluing the denim on. Wrap around, gluing the ends of the strips down. By pulling the strips tightly while wrapping, they will stay in place. Continue wrapping around the entire wreath. 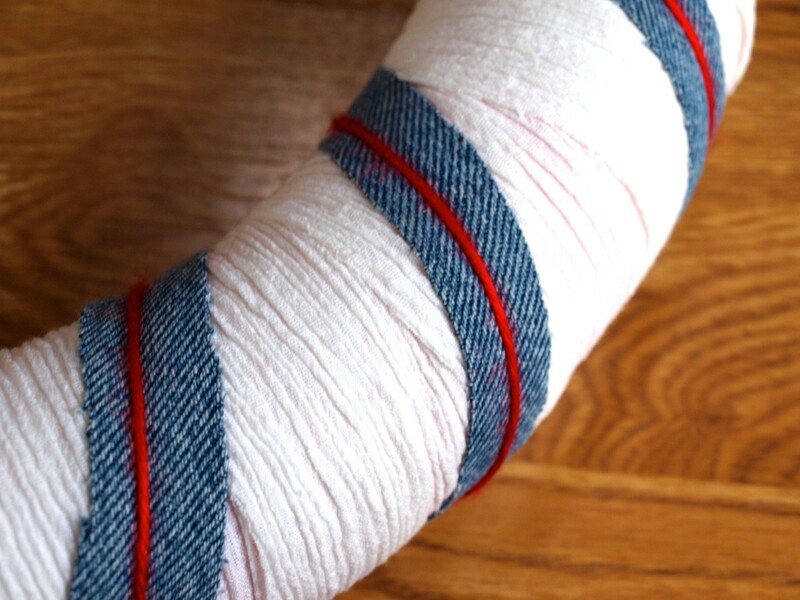 While wrapping, remember to make sure that the denim strips are evenly spaced. Set aside and let glue dry completely. Always pull snugly when wrapping the fabric. This ensures that the fabric will not move. You only need to glue at the beginning and the end of a strip. Start and end the fabric strip on the back side of the wreath. You may need to trim some excess fabric. You may notice that in some of the later photos there is no yarn on the wreath. I added it at the end, because after I had glued on the embellishments I realized that the wreath still needed something. I took some red yarn I had on hand and wrapped it around. I should have added it right after the denim strips were put on so that I didn't have to work around the buttons. I think the yarn adds just the right touch. 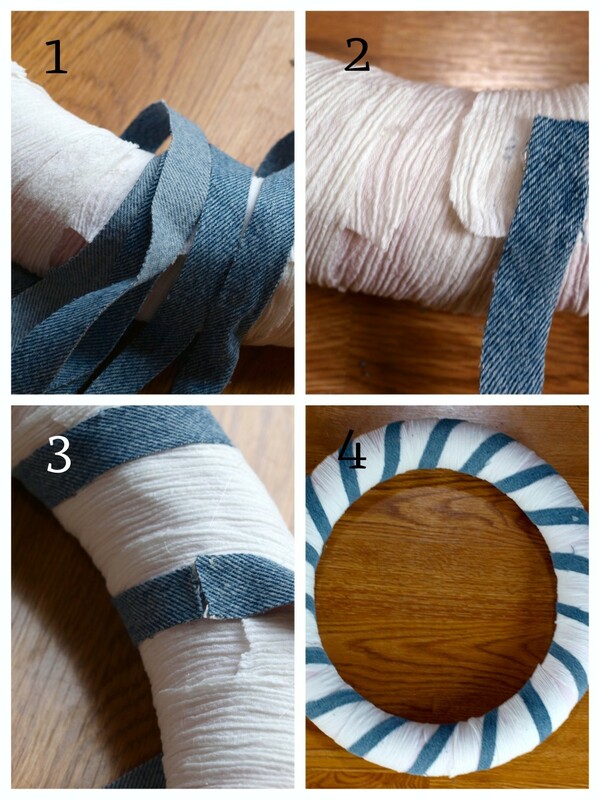 To add the yarn, glue one end on the back side and wrap around the entire wreath, centering it on the denim strips. Pull tightly and glue again at the end. Trim off the excess yarn. Get a plastic bowl or cup from your cupboard. It's easier to cut when it is thinner. Trace a flower, or any shape you wish to use, on the outside of the bowl. 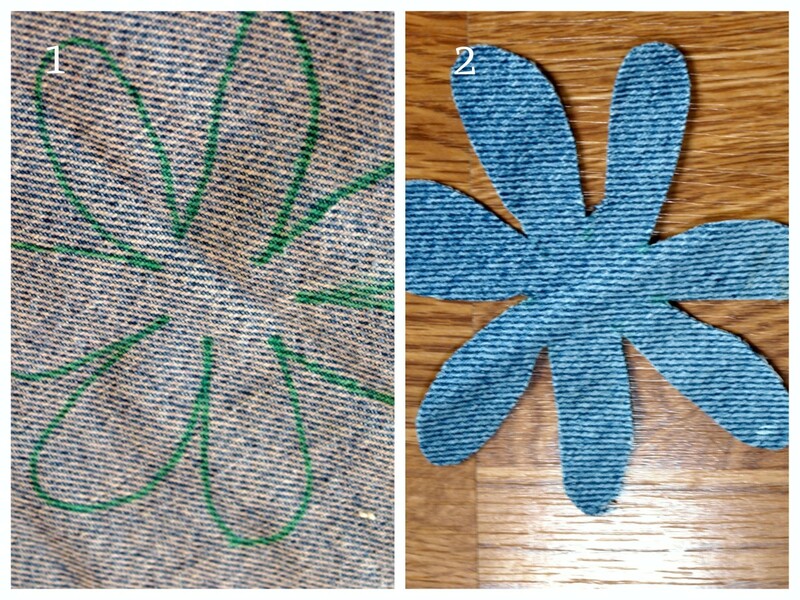 Trace a flower, smaller than the flower cut out of the bowl, onto the old jeans. Cut out the shape and set aside. Glue the plastic flower to the front side of the wreath once you've decided where the perfect placement is. 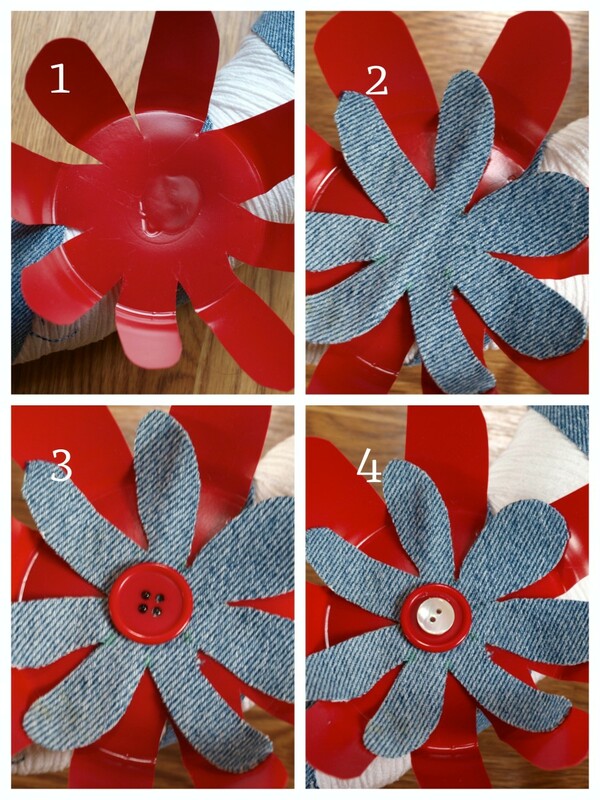 Center the denim flower in the plastic flower and glue it down. Glue a button embellishment in the center. For more dimension, add another button and glue in place. Set aside wreath to dry. 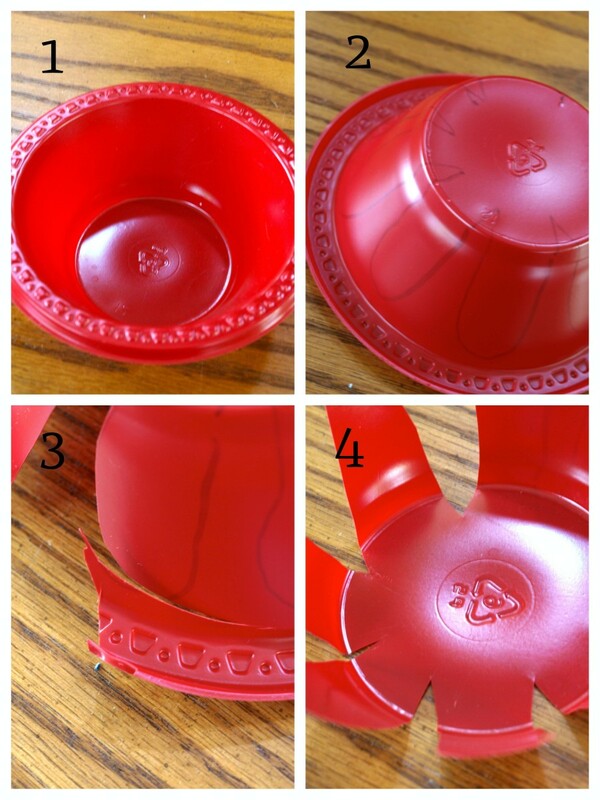 Glue pipe cleaners that have been twirled around a pencil to the underside of the red plastic bowl. Glue buttons in a random pattern around the flower and set aside to dry. Add a ribbon to hang it and you are done! Have fun when adding embellishments and use your imagination. There are so many fun things you can add to the wreath. 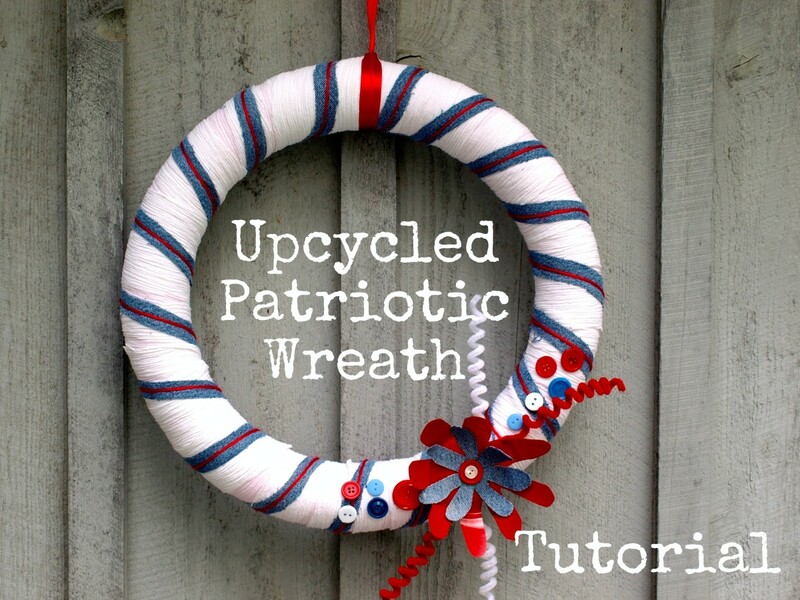 Why Make an Upcycled Wreath? 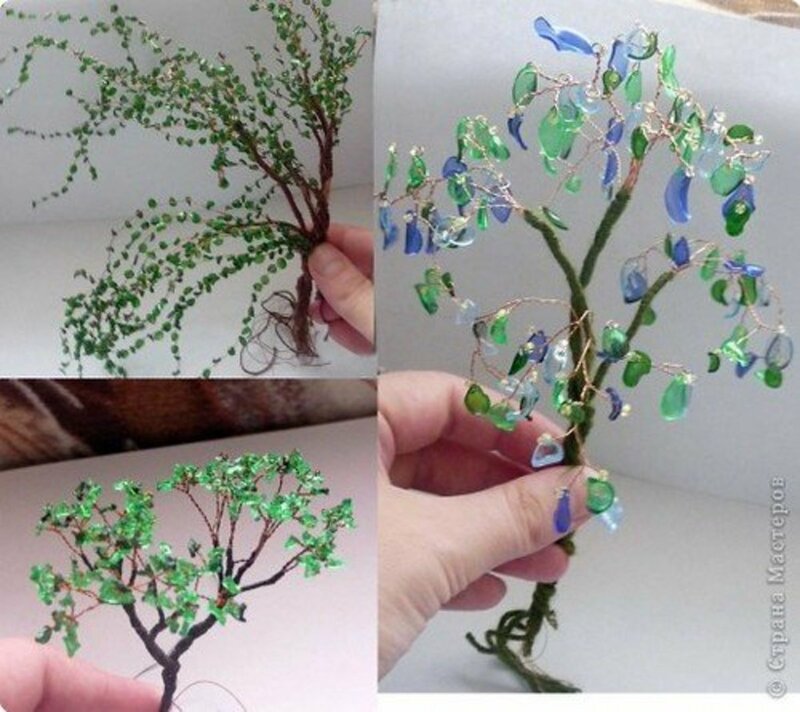 After having spent a lot of money on fabric and baubles for crafts over the years, I've come to realize that there are so many things I can do with items from around the house. Having a daughter who is environmentally conscious has also inspired me. It's easier to repurpose than you may think. If clothing items aren't in good enough shape to be donated, I don't throw them out. I turn them into fun projects like this throw pillow or this cute apron. Look around your cabinets or storage room and you can probably find loads of items that can be transformed into something else. If you aren't sure where to start, why not try this wreath. It will brighten up any doorway. Thanks very much Chantelle. I appreciate that! What a great idea. You are very creative. Thanks so much LeslieAdrienne. I'm glad you liked the project. Amazing... this should be on Pintrest! Aww thanks so much cclitgirl! I appreciate the comments and the pin! I've definitely been in an upcycling mood lately. Love your photos, your tutorial and all the good stuff here. I just had to pin this - great images for pinning here, too! Well done! This looks like a great reject for the holidays…thanks! I appreciate the nice comments Krysanthe. I like the fact that it can be changed up for any season too. 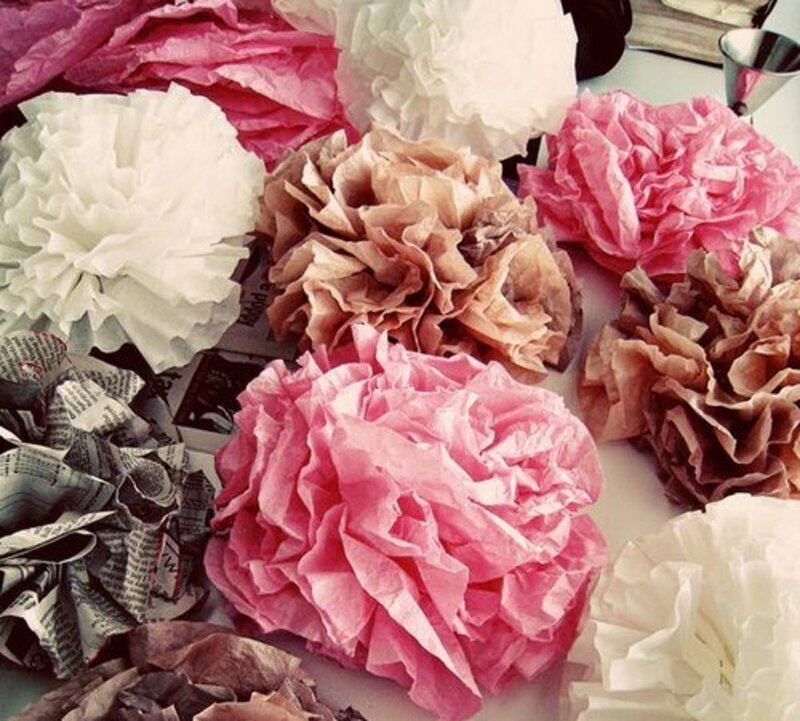 You can also add all sorts of embellishments that you may have around too, like pom poms or baubles of some kind. Thanks for stopping by and commenting. Thanks teaches - Unless they are destroyed, save those pool noodles. There are so many things they can be used for. I'm glad you liked the wreath. It's definitely a nice one for the summer months, and like you said, the 4th. Thank you so much Suzanne! Pool noodles are great and I still have a couple for the pool this summer! I appreciate your support. Hi Millionaire Tips - I too love that it was free, I mean what is better than than that! Thanks so much for stopping by and reading. Thanks so much randomcreative! I really had fun with this and since I have been doing more and more of these upcycled projects I'm realizing I should save more of my stuff. Glad you liked the wreath and thanks for the share! I just threw out some old pool noodles that were a bit frayed. Wish I would have saved them now! 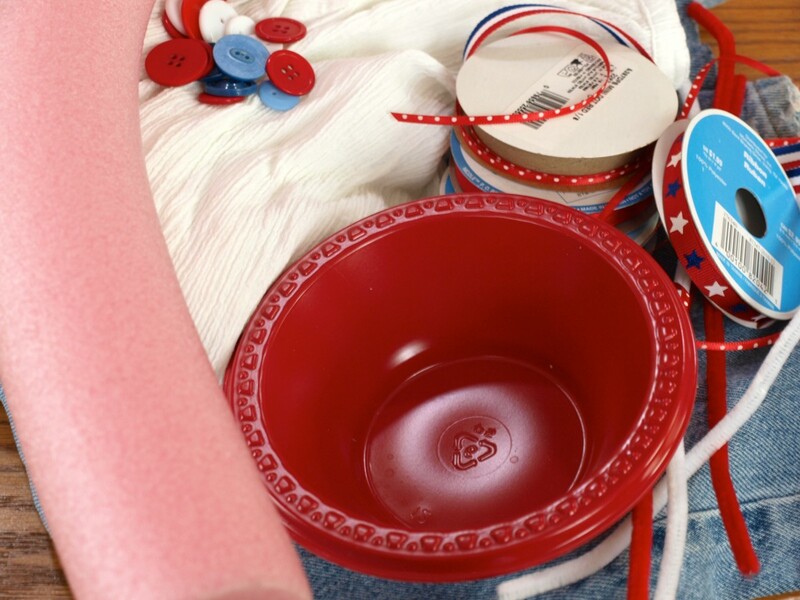 What a creative craft idea and one that will be so pretty for the upcoming Fourth of July holiday. A great idea - never knew you could use a pool noodle for this! The wreath looks fantastic with the flowers and buttons on it too. Thanks for the great concept and voted awesome! That's really cute - what a clever idea! I love that it was free for you and that you could make use of your old clothing and supplies. Thanks so much Sunshine! It was fun to make. I appreciate it DDE. I'm glad you enjoyed the craft and thanks for letting me know. Thanks so much Michelle. I appreciate it. Now I have to start thinking about more crafts to write about. Too bad you threw out that noodle EPbooks, although they are really cheap at the dollar store. Thanks for stopping by and commenting. A lovely idea and always a great thought from you. What a great share for the upcoming Memorial Day! You are a true Lady of Crafts, Glim! I love this! I actually just threw away a noodle we had and it would've been perfect for this project. Thanks for sharing! Thanks for sharing Jill! I'm glad you liked the project. 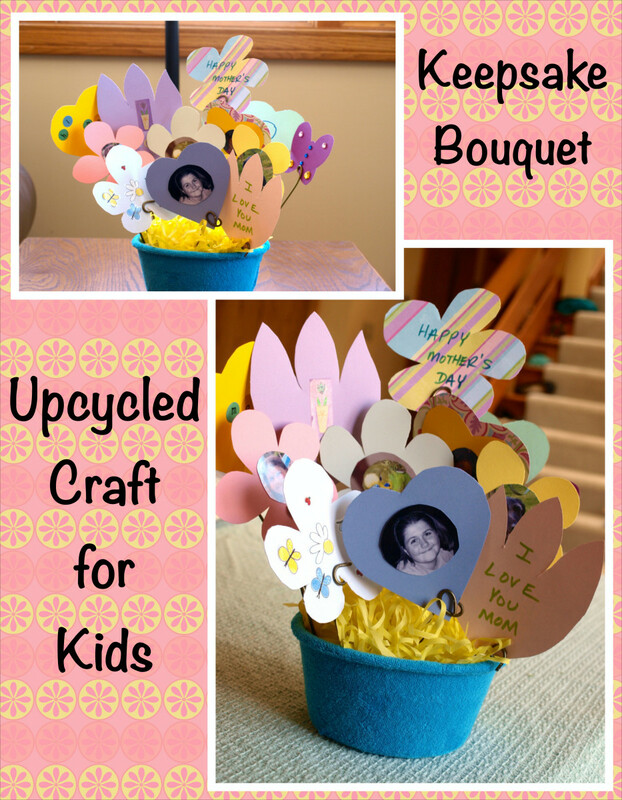 I am thinking that there are garden tools that could be repurposed into something crafty! Enjoy your Memorial Day weekend. Hi CyberShelley - There is definitely no sewing with this one and gluing is pretty easy. That's one of the things that makes this one so much fun. Thanks so much for reading and commenting. Thank you AliciaC. Since I've been repurposing more I am getting into it more. It's surprising how much can be done with household items. Glad you liked the hub and I appreciate the kind comments. Hi travmaj - The best thing about this project is that there is no sewing for those that don't like to. It can be tailored to any occasion and almost anything can be used. Those are my favorite kinds of crafts. Thanks for stopping by and reading. Thanks so much MsDora - I enjoyed this project and am glad you did too. Hopefully lots of people will like it. BNadyn - I bet there are loads of things you could do with those pool noodle scraps. If they are too short, tape a couple together. I've really been looking at the clothes I get rid of. Many times they are in just too bad a shape to donate so I like that they can be used in different ways. Thanks for reading and commenting. I appreciate it! Better Yourself - I was thinking people would like this for the 4th as well. I usually decorate with patriotic colors throughout the summer so this fits right in. Thanks for stopping by! Hi purl3agony - I'm glad you enjoyed this wreath project since you make such lovely ones. Now if I only had a black door like the ones in your photos I'd be set. I have a glass door so I hung this on the side of my house. Thanks for all of the support! Have a lovely Memorial Day weekend. Many thanks ChitrangandaSharan! I'm very fond of this project and glad that others are too. I appreciate your kind remarks. Thank you Jackie! My husband was really surprised that it was a plastic bowl too! Glad you enjoyed this project. Enjoy your Memorial Day weekend. What a marvellous creative idea - thank you for sharing. As it doesn't involve intricate sewing, it something I too can attempt! Up, interesting, beautiful and Pinning it! This is a very creative project, Glimmer! I love the idea of upcycling. It's not only fun and inexpensive but also important for the environment. Your wreath is a great idea! Absolutely fantastic, practical, useful and valuable. Great tutorial! Thank you! I am a huge fan of upcycling and like you, before recycling or donating, I'll look at an item to see if I can upcycle it instead. I just love this wreath and didn't even realize it was a pool noodle from the finished product when I first began to read it! We have so many left over pool noodles when I used them for my son's party as lightsabers, LOL. I have them all in a box trying to figure out what to do with them because they've been cut. I'm going to see if I can turn them into a wreath now. Thanks for this tutorial, very creative. Just in time to make and get ready for July! Great, idea, great hub and great upcycling! Hi Glimmer Twin Fan! I love this wreath!! Such a smart idea to use a foam pool tube as the wreath form. And I love your mix of materials (and the addition of buttons!!!) in decorating your wreath. Just charming. Voted up and pinned. emilybee - I am definitely seeing lots of wreaths so I'm hoping people will like this one. The repurposing gives it some added interest. Glad you liked the project. Thanks for stopping by and commenting. Hi Bill - Thanks so much for all of your support. My craft mindset right now is definitely on repurposing things. Supplies are so expensive so why not use what I have on hand first. Thanks for reading and sharing. Have a great day. lilmissmontana - Have fun making your wreath. I think it would be fun to try in different colors. I have a green shirt that is screaming St. Patrick's day to me. Thanks for reading and commenting. Thank you FlourishAnyway! It's fun trying to figure out neat things to do with household items. I appreciate you stopping by. Have a great day! Thanks for the support Rebecca! This was a fun one to do and I enjoyed the challenge of trying to figure out what to use. Glad you enjoyed it! This is too good and so creative! The way you have explained with pictures, it can be a very good summer vacations project for kids. 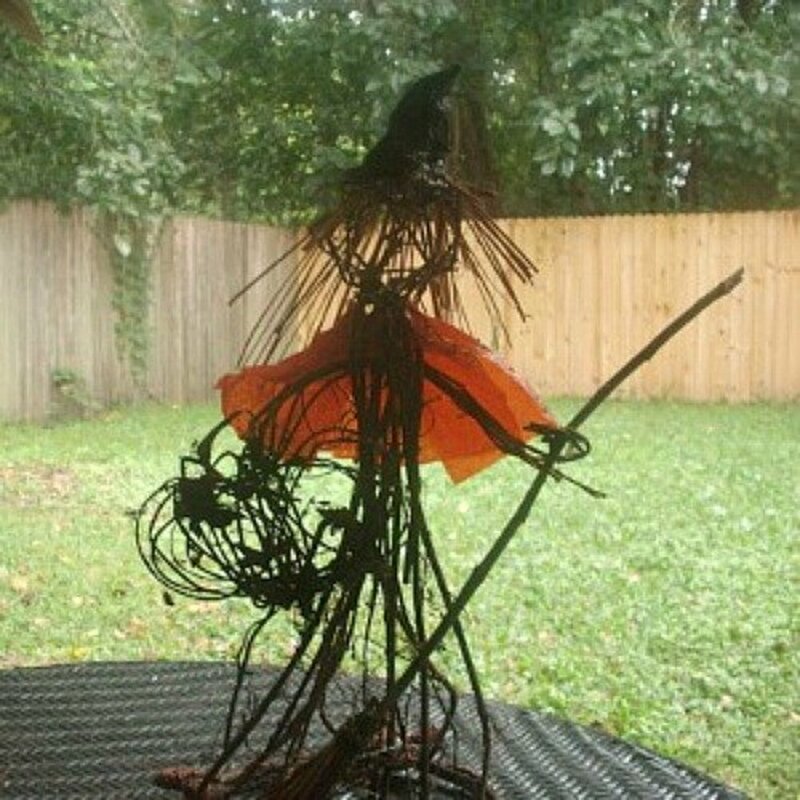 Voted up as useful and interesting and shared on HP! Hi Nell - This one doesn't require any sewing so it's super easy. I bet you could do this easily. I hope you give this one a try. Thanks for stopping by and reading! Thank you so much Bill. I appreciate that you notice the photos. I'm really enjoying taking the photos for my hubs. Now if everyone else in cyberworld would notice I'd be mighty happy. Who knows, maybe one of these days you'll actually try one of my projects. Have a great evening. Looks awesome and not too difficult! 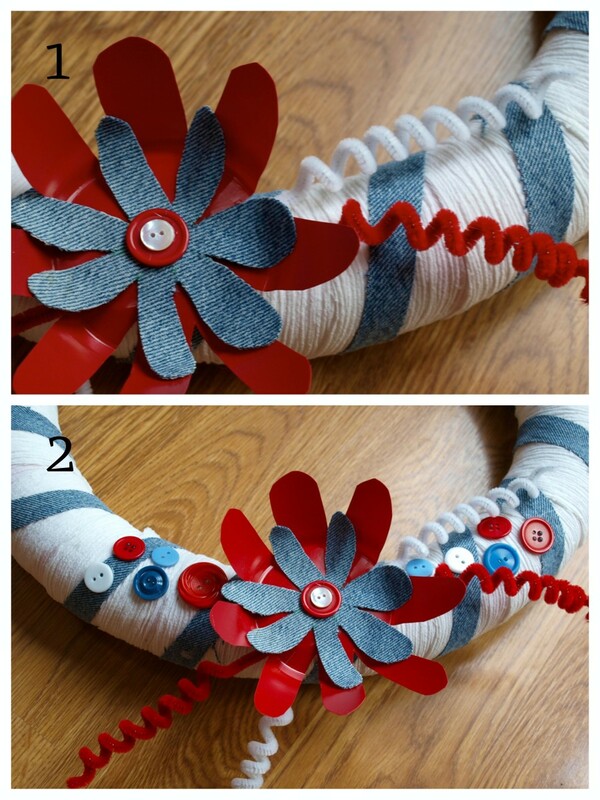 These wreaths are trending now too, thanks for sharing how to make them ! Hi Glimmer. How creative. This is something that my uncreative mind never would have thought of. I love the idea of up-cycling. Instead of throwing stuff out why not turn it into something useful. Another winner. Voted up, shared, pinned, etc.... Have a great week. This is beautiful and so clever! 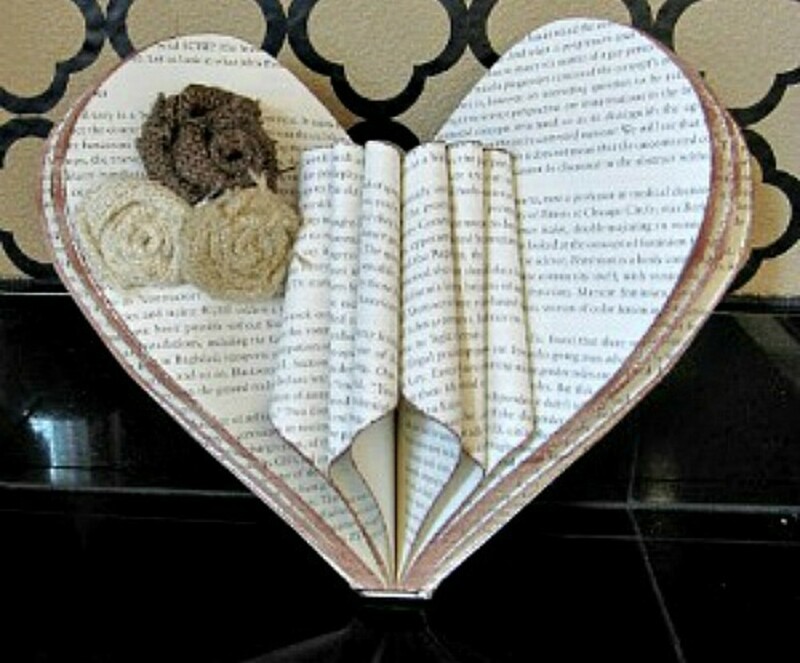 I might have to stop by a thrift store and a craft store so I can make it or something similar! Thank you for sharing! Truly unique to use an old pool noodle and white shirt. A gold star for creativity goes to you! Very clever! The utmost in both creativity and repurposing. Shared and pinned for sure! There isn't much chance of me doing this, but I just had to stop by and say hello. You know, your hubs are visually appealing. Not everyone's are you know. This is a pleasure to look at, and I'm quite certain, for crafters, it is loaded with great information. I hope you are having a great week, my friend. Thanks suzzycue! I appreciate it and the pin. I'm getting into these types of crafts more and more. Have a great day!